give the gift that keeps on giving this season with the reef guatemalan love sandal. in the mayan highlands of guatemala, weaving is an ancient tradition that has been passed down from mother to daughter through generations. 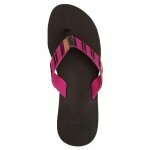 through a partnership with the nonprofit organization nest, the woven straps on this sandal are lovingly handcrafted. this tradition preserves cultural art forms while providing livelihood for women in need. purchase with a purpose and change lives with the reef guatemalan love.